For beverage pairings, red wine seems the most obvious however, for some, this can cause a dry mouth. Besides being too light for a steak, an American pilsner style beer can cause burps from all the carbonation. 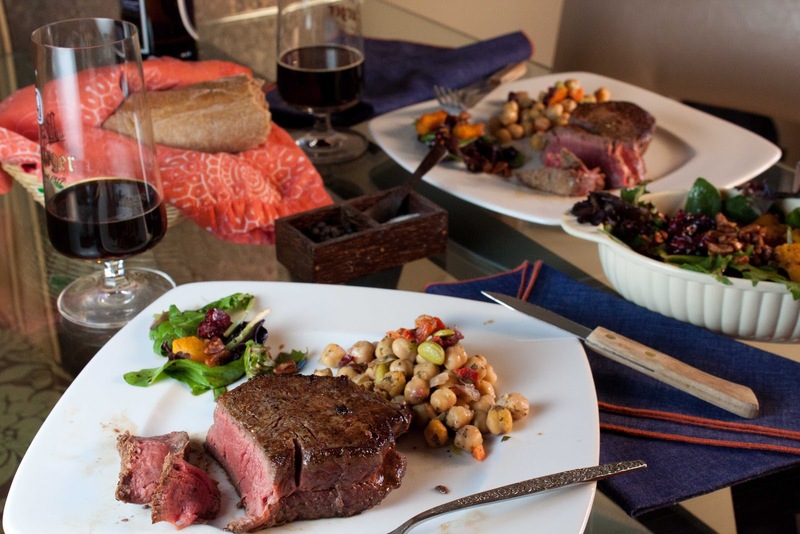 Try something casual like a porter or a dark amber to add depth to the meal. Just limit yourself to one or two at most. One final thought- just because it's called Steak and a BJ day doesn't mean the steak has to come first. After all, what guy doesn't want dessert first? Fat and Happy Food Blog Tips and Techniques: Piercing the steak will cause a dry steak by allowing the juice to run out so use a pair of tongs over a fork to flip the steak. 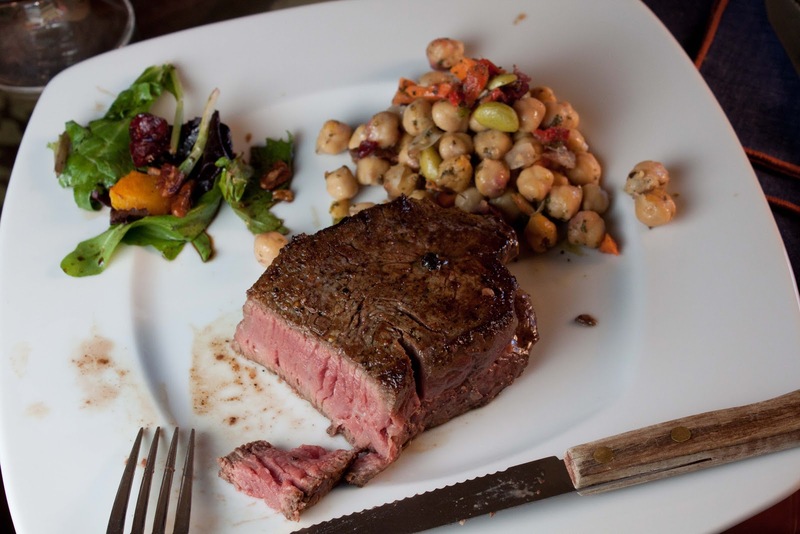 Always let your steak come to room temperature before cooking it. I'm sure you can find something to do for a half hour. Place the steaks on the counter and liberally sprinkle both sides with course salt and cracked pepper. Let the steak sit for 30 minutes to come to room temperature. Preheat oven to 450 degrees. Heat the olive oil and 1 tablespoon of butter in a cast iron or heavy pan until hot, nearly smoking. Use a paper towel to dry off the steaks, just pat them dry on both sides. Place the steaks in the hot pan and cook for 3 minutes per side. Place the pan in the oven and let cook for 4 minutes, depending on your desired doneness. Four minutes in the oven gave me a perfect rare to medium rare steak. Let yours go for another minute or two if you want them slightly more medium but I implore you not to cook them past 8 minutes because they will result in a dry steak. To test for doneness press your finger onto the steak, how does it feel? Now touch your thumb and your index finger together in an "OK" sign, and then press the fleshy part of your palm right below the thumb with your other hand. Feel how soft and malleable that is? That's the way rare steak feels when you press it! Now touch your other fingers to your thumb, one at a time. As you move from your index finger to your pinky, the pad of your thumb will get progressively more firm and resistant. This feels similar to steak as it cooks, moving from rare (index finger) to medium-rare (middle finger) to medium (ring finger) to well-done (pinky). 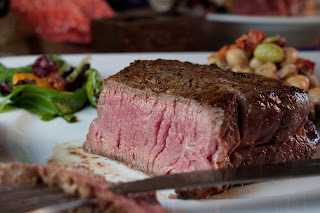 Test your steak often and remember they will continue to cook slightly even after they are removed from the heat. Remove the steaks from the pan, place a pat of butter on top of each, set them on a plate and loosely cover them with tin foil. Allow the steaks to rest for 10 minutes before you cut into them. Just walk away, don't touch them at all. Ready the side salad, pour the beverages and set the table while you are letting the steaks rest. Plate the steak with your side dishes and serve. Savor every bite.